Andrew Zimbalist, 2005: "Thus, the ultimate public contribution may rise above the $200 million level"
It stands as one of the most willfully naive statements in the Atlantic Yards saga. Forest City Ratner's "sports economist for hire," Andrew Zimbalist, once said that the direct subsidies would be $200 million but allowed, "Thus, the ultimate public contribution may rise above the $200 million level." Mr. Ratner has also talked to state and city officials about their doing $150 million in roadwork, sewers and utilities, and moving tracks currently at the rail yard. The developer has also asked the state and city to commit to using about $28 million a year in sales and income taxes generated by the project to help pay down the bonds for the arena. That was the abandoned plan for tax-increment financing. But $28 million a year times 30 years would've added up to $840 million--a total that never appeared in print and that likely would've given Ratner the arena for nothing. Then Zimbalist, in May 2004 issued his first report on AY finances, which we could call "The $4 billion lie," a prelude to the updated report, aka "The $6 billion lie." According to public information, the city and state will each contribute $9 million per year toward the debt service of the arena bonds. This payment will continue at the same level for the life of the bonds (thirty years). Part of the payment is for use rights for public events at the arena. Further, the needed infrastructural work (including the platform over the rail yards and utilities upgrade/relocation) and eminent domain takings are estimated to cost $162.73 million. To be cautious, I add $25 million in contingency funds, yielding $187.73 million. Using a 5.5 percent discount rate, the present value of these combined costs to the city and state treasuries is $449.34 million. Where did the $9 million come from? The $9 million figure that "appeared all over the place" at least appeared in some Forest City Ratner documents not released at the time. As I wrote in July 2007, a 10/22/03 presentation by FCR to the Empire State Development Corporation, unearthed via Assemblyman Jim Brennan's lawsuit, set out a plan in which the Local Development Corporation running the arena would offer three leases, two to government agencies and one to the developer. The developer would pay just $1. One lease will be from the LDC to the City and one to the State (the "Public Party Leases") to use the arena facility at specified times for indoor state-of-the-art amateur sporting events of the Boards of Education and Higher Education, private secondary schools and colleges and community organizations. The term of the leases will be equal to the term of the LDC bonds. The City and the State would each pay $9 Million per year for a total annual rent of $18 Million for the Public Party Leases. It is anticipated that these payments would be offset by the new incremental sales and other taxes generated by the arena. That, apparently, didn't fly. Government negotiators must have recognized it was not exactly a good deal. After all, even if there were 80 events a year under the Public Party lease, that would be $225,000 an event. According to the February 18, 2005 MOU among the ESDC, NYEDC, the City of New York and FCRC, the city and state will each make capital contributions of $100 million to the project. These capital contributions can be used to fund land acquisition for the arena, site preparation and public infrastructure improvements on and around the arena site (including streets, sidewalks, utility relocation, environmental remediation, open space improvements, public parking garages). The total direct public contribution to the Atlantic Yards project is $200 million. In my initial report of May 1, 2004, I estimated that the total public contribution would include $9 million of annual payments each from the city and state for thirty years (with a present value of $261.61 million) and $187.73 million of other infrastructure contributions. The present value of the total public contribution in my first report, then, was $449.34 million. The negotiated MOU indicates that the public contribution will be as much as $249.34 million less than this initial estimate. The MOU also allows for the possibility of additional public contributions, to be made at the discretion of the city and the state, to support extraordinary infrastructure costs relating to the mixed-use residential development at Atlantic Yards. Thus, the ultimate public contribution may rise above the $200 million level. 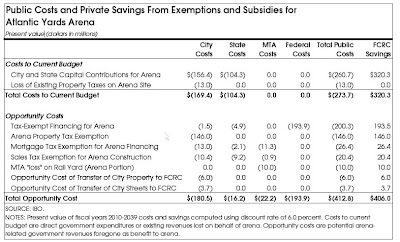 Consider that the New York City Independent Budget Office, looking only at the arena and not at housing (and other) subsidies, concluded in September that there would be $260.7 million in city and state capital contributions and $13 million in lost existing property taxes, adding up to $273.7 million in losses to the budget. Beyond that, the IBO estimated $180.5 million in lost opportunity costs for the city, $38.4 million for the state and MTA, and $193.9 million for federal taxpayers. And that's without even considering the bestowal of naming rights, which would bring a reported $400 million. And there's a whole lot more.